In our last two posts, we focused on the software aspects of the Arduino. We saw that Arduino boards are programmed using a language derived from C and C++ in Arduino’s Integrated Development Environment (IDE) and learned a few basic debugging methods. 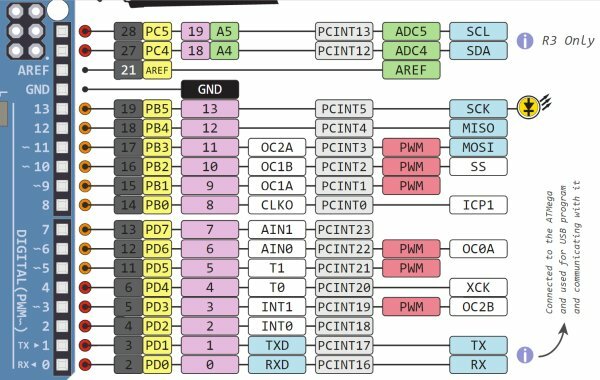 In this post, we’ll be taking a closer look at the Arduino hardware, and more specifically, the Arduino Uno pinout. Arduino Uno is based on the ATmega328 by Atmel. 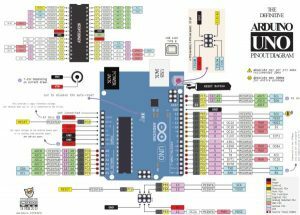 The Arduino Uno pinout consists of 14 digital pins, 6 analog inputs, a power jack, USB connection and ICSP header. The versatility of the pinout provides many different options such as driving motors, LEDs, reading sensors and more. In this post, we’ll go over the capabilities of the Arduino Uno pinout. Barrel Jack – The Barrel jack, or DC Power Jack can be used to power your Arduino board. The barrel jack is usually connected to a wall adapter. The board can be powered by 5-20 volts but the manufacturer recommends to keep it between 7-12 volts. Above 12 volts, the regulators might overheat, and below 7 volts, might not suffice. 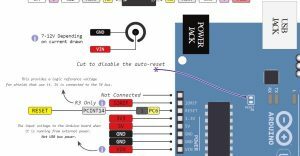 VIN Pin – This pin is used to power the Arduino Uno board using an external power source. The voltage should be within the range mentioned above. USB cable – when connected to the computer, provides 5 volts at 500mA. There is a polarity protection diode connecting between the positive of the barrel jack to the VIN pin, rated at 1 Ampere. The power source you use determines the power you have available for your circuit. For instance, powering the circuit using the USB limits you to 500mA. 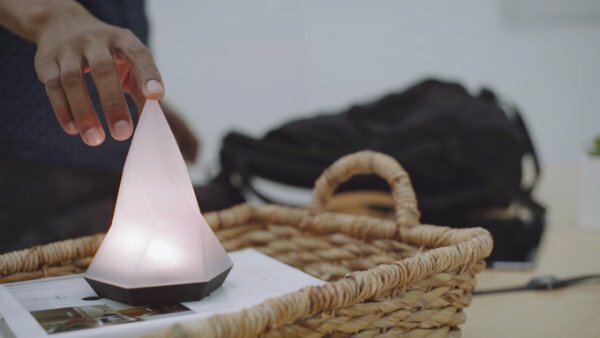 Take into consideration that this is also used for powering the MCU, its peripherals, the on-board regulators, and the components connected to it. When powering your circuit through the barrel jack or VIN, the maximum capacity available is determined by the 5 and 3.3 volts regulators on-board the Arduino. They provide regulated 5 and 3.3v to power external components according to manufacturer specifications. In the Arduino Uno pinout, you can find 5 GND pins, which are all interconnected. The GND pins are used to close the electrical circuit and provide a common logic reference level throughout your circuit. Always make sure that all GNDs (of the Arduino, peripherals and components) are connected to one another and have a common ground. IOREF – This pin is the input/output reference. It provides the voltage reference with which the microcontroller operates. The Arduino Uno has 6 analog pins, which utilize ADC (Analog to Digital converter). These pins serve as analog inputs but can also function as digital inputs or digital outputs. ADC stands for Analog to Digital Converter. ADC is an electronic circuit used to convert analog signals into digital signals. This digital representation of analog signals allows the processor (which is a digital device) to measure the analog signal and use it through its operation. Arduino Pins A0-A5 are capable of reading analog voltages. On Arduino the ADC has 10-bit resolution, meaning it can represent analog voltage by 1,024 digital levels. The ADC converts voltage into bits which the microprocessor can understand. One common example of an ADC is Voice over IP (VoIP). Every smartphone has a microphone that converts sound waves (voice) into analog voltage. This goes through the device’s ADC, gets converted into digital data, which is transmitted to the receiving side over the internet. Pins 0-13 of the Arduino Uno serve as digital input/output pins. Pin 13 of the Arduino Uno is connected to the built-in LED. In the Arduino Uno – pins 3,5,6,9,10,11 have PWM capability. ● Each pin can provide/sink up to 40 mA max. But the recommended current is 20 mA. Digital is a way of representing voltage in 1 bit: either 0 or 1. Digital pins on the Arduino are pins designed to be configured as inputs or outputs according to the needs of the user. Digital pins are either on or off. When ON they are in a HIGH voltage state of 5V and when OFF they are in a LOW voltage state of 0V. On the Arduino, When the digital pins are configured as output, they are set to 0 or 5 volts. ● Below 0.8v – considered as 0. ● Above 2v – considered as 1. 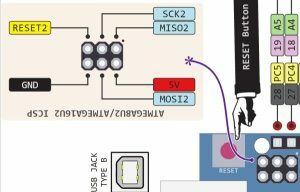 When connecting a component to a digital pin, make sure that the logic levels match. If the voltage is in between the thresholds, the returning value will be undefined. In general, Pulse Width Modulation (PWM) is a modulation technique used to encode a message into a pulsing signal. A PWM is comprised of two key components: frequency and duty cycle. The PWM frequency dictates how long it takes to complete a single cycle (period) and how quickly the signal fluctuates from high to low. The duty cycle determines how long a signal stays high out of the total period. Duty cycle is represented in percentage. PWM signals are used for speed control of DC motors, dimming LEDs and more. Serial (TTL) – Digital pins 0 and 1 are the serial pins of the Arduino Uno. They are used by the onboard USB module. Serial communication is used to exchange data between the Arduino board and another serial device such as computers, displays, sensors and more. Each Arduino board has at least one serial port. 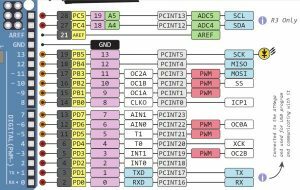 Serial communication occurs on digital pins 0 (RX) and 1 (TX) as well as via USB. Arduino supports serial communication through digital pins with the SoftwareSerial Library as well. This allows the user to connect multiple serial-enabled devices and leave the main serial port available for the USB. Software serial and hardware serial – Most microcontrollers have hardware designed to communicate with other serial devices. Software serial ports use a pin-change interrupt system to communicate. There is a built-in library for Software Serial communication. Software serial is used by the processor to simulate extra serial ports. The only drawback with software serial is that it requires more processing and cannot support the same high speeds as hardware serial. 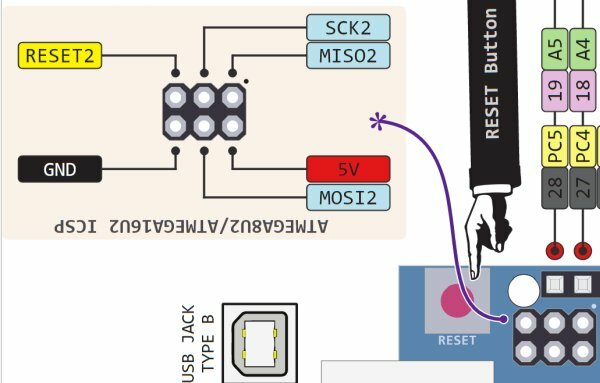 SPI – SS/SCK/MISO/MOSI pins are the dedicated pins for SPI communication. They can be found on digital pins 10-13 of the Arduino Uno and on the ICSP headers. Serial Peripheral Interface (SPI) is a serial data protocol used by microcontrollers to communicate with one or more external devices in a bus like connection. The SPI can also be used to connect 2 microcontrollers. On the SPI bus, there is always one device that is denoted as a Master device and all the rest as Slaves. In most cases, the microcontroller is the Master device. The SS (Slave Select) pin determines which device the Master is currently communicating with. SCK (Serial Clock) – A clock signal generated by the Master device to synchronize data transmission. I2C – SCL/SDA pins are the dedicated pins for I2C communication. On the Arduino Uno they are found on Analog pins A4 and A5. I2C is a communication protocol commonly referred to as the “I2C bus”. The I2C protocol was designed to enable communication between components on a single circuit board. With I2C there are 2 wires referred to as SCL and SDA. SCL is the clock line which is designed to synchronize data transfers. SDA is the line used to transmit data. Each device on the I2C bus has a unique address, up to 255 devices can be connected on the same bus. Aref – Reference voltage for the analog inputs. Interrupt – INT0 and INT1. Arduino Uno has two external interrupt pins. External Interrupt – An external interrupt is a system interrupt that occurs when outside interference is present. Interference can come from the user or other hardware devices in the network. Common uses for these interrupts in Arduino are reading the frequency a square wave generated by encoders or waking up the processor upon an external event. There are two external interrupt pins on the ATmega168/328 called INT0 and INT1. both INT0 and INT1 are mapped to pins 2 and 3. In contrast, Pin Change interrupts can be activated on any of the pins. ICSP stands for In-Circuit Serial Programming. The name originated from In-System Programming headers (ISP). Manufacturers like Atmel who work with Arduino have developed their own in-circuit serial programming headers. These pins enable the user to program the Arduino boards’ firmware. There are six ICSP pins available on the Arduino board that can be hooked to a programmer device via a programming cable. The Arduino Uno Microcontroller is one of the most versatile boards on the market today and that’s why we decided to focus on it in this guide. This guide displays most of its capabilities, but there are also more advanced options which we did not go into in this post. The important thing to know when you choose a board for your project is its capabilities and limitations. It’s also important to understand the different communication protocols that the board uses. Of course, you don’t need to remember all of this information, you can always go back to this post and read the relevant information for you (this is a good time to bookmark this post btw).